262 pages | 6 B/W Illus. In the World Library of Psychologists series, international experts themselves present career-long collections of what they judge to be their finest pieces – extracts from books, key articles, salient research findings, and their major practical theoretical contributions. 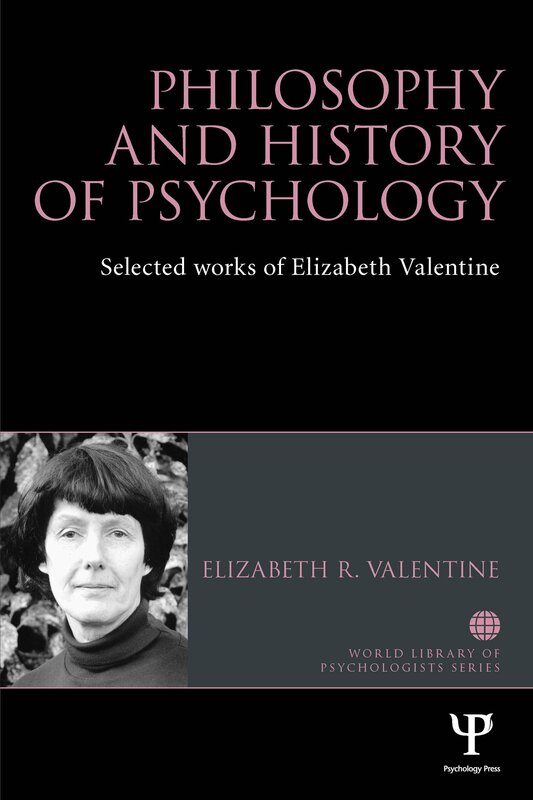 Elizabeth Valentine has an international reputation as an eminent scholar and pioneer in the field of philosophy and history of psychology. This selection brings together some of her best work over the last thirty years. A specially written introduction gives an overview of her career and contextualises the selection in relation to changes in the field during this time. The first section on ‘Philosophy’ covers work on different theoretical approaches to psychology, introspection and the study of consciousness, the mind-body problem, and different types of explanation in psychology including reductionism. The second section, ‘From Philosophy to History’, includes work on the philosophical psychologists G. F. Stout and James Sully, among others. The third section on ‘History’ covers Valentine’s more recent historical work on the development of psychology in London – both institutional and biographical – and includes accounts of both Bedford College and University College, and the role of pioneer women psychologists. The book enables the reader to trace developments in the philosophy and history of psychology over the last thirty years. It will appeal to anyone with interests in these areas as well as being an invaluable resource for graduate and advanced undergraduate courses in conceptual and historical issues. Elizabeth R. Valentine is Emeritus Professor of Psychology at Royal Holloway, University of London and Honorary Senior Research Associate at University College London, UK. Best known as the author of Conceptual Issues in Psychology, she has published many papers on theoretical psychology and experimental psychology. She is a founder member and former chair of the History and Philosophy of Psychology Section of the British Psychological Society, and the founding editor of its periodical, History & Philosophy of Psychology.